Abul-Hasan Alí Ibn Nafí, known as Ziryab, was born in Iraq in 789. He was nicknamed Ziryab because of his melodious voice and his dark complexion, features which people compared with mir it, a singing bird of black plumage. He was a gifted pupil of Ishaq al-Mawsili, a renowned musician in Baghdad and a favourite of the Abbasid Caliph Harun Al-Rashid. Ziryab's talent and excellence in music slowly overtook the position of his teacher, which brought him close to the Caliph and his court. Al-Hakem, the Umayyad Caliph and father of Abd-Al-Rahman II invited him to Andalusia. Zaryab settled in Cordoba in 822, at the court of the then Caliph Abd-Al-Rahman II. His arrival coincided with a new impetus given by Abd-Al-Rahman II to cultural life, leading Andalusia to one of its major flowering periods. In Cordoba, Ziryab found prosperity, recognition of his art and unprecedented fame. He became the court entertainer with a monthly salary of 200 golden Dinars in addition to many privileges. This promotion gave him a great opportunity to let his talent and creation break free from any boundaries. He not only revolutionised music but also made significant improvements to lifestyle and fashion. In music, he was the first to introduce the lute (Al-U'd) to Spain and Europe in general. He is credited, with Al-Kindi, with the addition of the fifth bass string to it and substituted the wooden plectrum for the eagle's quill. In Spain, as well as North Africa, he substituted the singing system of Medina with that of Iraq (Reference: Plaencia, G. (1928), ' History of Literature Arabic-Spanish', Barcelona, page 41). He established the first conservatoire in the world, which included the teaching of harmony and composition and was to develop even further in the following centuries. Regarding musical theory, he rearranged it completely, setting free the metrical and rhythmical parameters and creating new ways of expression (mwashah, zajal, and nawbah suites). Many, like Julian Ribera, even maintain that counterpoint and polyphony were first developed in the Cordoba conservatoire around 1000 CE. Ziryab is credited with compiling a repertoire with 24 Nawbaat (vocal and instrumental suites). Each Nuba was a composite of vocal and instrumental pieces organised in nine movements and each movement had its own rhythm. He knew more than one thousand songs, of which some, according to Al-Maqqari, belong to Ptolemy. He transformed social customs as seen in dress and hair styling, in the kitchen and the way people eat, socialise and relax, and in the furniture and tools he invented to follow this transformation in living. He replaced the gold glasses by others made of glass and crystal. (Soon initiated their manufacture in Andalusia. see Lévi-Provençal, Évariste (1950), 'Histoire de l'Espagne musulmane; Le califat umaiyade de Cordoue', Nouvelle édition, rev. et augm. G. P. Maisonneuve - (Histoire du Monde de l'Islam), Paris). He spread the use of the tablecloth and the wearing of white dress in the summer. He also introduced new culinary recipes, new tableware, new sartorial fashions and even the games of chess and polo. Reference: (Ree Hans, (1999), ‘The Human Comedy of Chess', Russell Enterprises, English Algebraic Notation). "After the arrival of this oriental (Ziryab), a wind of pleasure and luxurious life blew through Cordoba. An atmosphere filled with poetry and exquisite delight surrounded Ziryab; he composed his songs at night in the company of two servants who played the lute. He gave his art an unprecedented value, nearly magic, especially as he explains the symbolic significance of the strings of the lute. He maintained that the first four represented the bile (bitterness of temper), the coolness, blood and the black moods, while the fifth he considered as the soul. He was also a scholar renowned for his knowledge in astronomy and geography. Ziryab became connected to themes of elegance; with his refined and luxurious tastes he defined the court of the Caliphs. He brought from the Orient, the toilet accessories (perfumes, cosmetics, toothpaste) and new modes, which left great impact. Most Cordobans imitated his hairstyle. This great artist was also a gastronome introducing a number of exotic unknown recipes. Ziryab launched a number of modes and fashions, which lasted for centuries. He brought to Spain crystal glasses and leather furniture. He introduced winter and summer dresses, setting exactly the dates when each fashion is worn. He also added dresses of half season for between seasons. Through him, the luxurious dress of the Orient was introduced in Spain. Under his influence a fashion manufacturing was set up producing coloured striped fabric and coats of transparent fabric, which is still found in Morocco today. Without a doubt, a lone man could not achieve this transformation. It is rather the development, which shook the Muslim world in general although the historic legend attributes all these changes to the figure of Ziryab and his promoter, Abd-Al-Rahman II." (Translated from French) Terrace, H. (1958) 'Islam d'Espagne' une rencontre de l'Orient et de l'Occident", Librairie Plon, Paris, pp. 52-53. (Right) 18th century manuscript on musical composition and rhythm showing a rababah. Topkapi Palace Museum Library, H 1793. 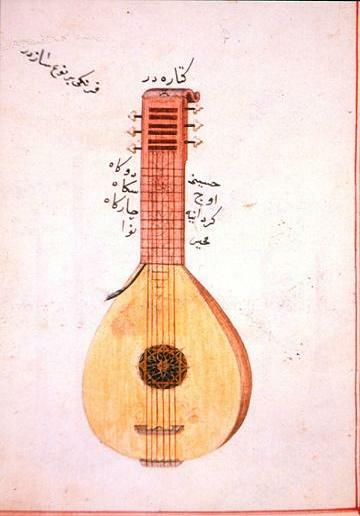 (Right) A drawing of a musical instrument al-Qattara in a manuscript. Topkapi Palace Library, Hazine, MS 2164. A few scenes by İnci Özen from the Dar al-Shifa of Anbar bin Abdullah during the Seljuk reign in Turkey.